1 D.I.Y. curtain rod steel regular 16 feet long -- BasicQ Inc.
White finished metal, 3/4 inch high, 3/8 inch thick by 16 feet long, 1 to 1.25 lb per foot capacity. Use for pinch Pleat drapery, one-way draw up to 16 feet, 16 pounds, or two-way up to 32 feet, 30 pounds maximum. 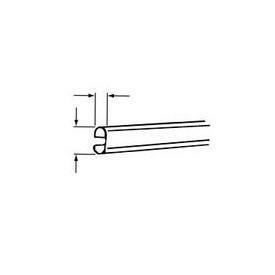 Note: sizes over rod width can use splice number 9907-061 to extend to your needs. Can be angular bent using 8" radius or circular curved 48" radius. Use for one way draw or two way draw. Use for ceiling mounted curtain rods. Priced by the Foot When having track cut, choose UPS for Cut Track in the Shipping Methods at check out. Maximum cut must be less than 105 inches. Minimum 16 feet. Price unit one foot.